There is no dispute, Beethoven is one of the very greatest composers who ever lived. His music is among the most important music ever written, and it will continue to thrive as a vital organ in Planet Earth. Ludwig van Beethoven, born in Bonn, Germany, was the second-oldest child of the court musician and tenor singer Johann van Beethoven who drilled him on the piano to help him become a child prodigy. Ludwig first performed publicly when he was eight years old. At age 11, he began study with organist and court musician Christian Gottlob Neefe. the streets of Vienna, deep in thought In 1792 he moved to the musical center of Vienna and took lessons from Schenck, Albrechtsberger, Salieri, and Haydn. By 1795 he become well known as a pianist. He was particularly admired for his brilliant improvisations. Several years later, Beethoven realized that he was having difficulty hearing. He withdrew into increasing seclusion for the public and from his few friends and eventually became deaf. Number 3, the Eroica, created one of the greatest turning points in the history of music. 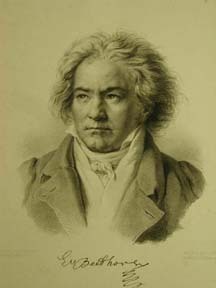 Up to the time of this great work, Beethoven's work was stylistically in the vein of the music of the time, a style led by Mozart and Hadyn, among others. When in 1804 the Eroica was first private performed, Beethoven issued in a new era of music: the Romantic Era. Never before had music such as this ever been played. It was filled with joy, rapture, sadness, emotions never before expressed in music. This was a clear voice of greatness beginning to speak. The Fifth Symphony is a work of power and grandeur, not of anger as some have stated. The wonderful sixth symphony, featured in the Disney movie Fantasia, is a healing journey of gentleness and pastoral beauty. The seventh and the ninth (choral) are the other two most respected of his symphonic works. Beethoven's piano sonatas and concertos are among the very greatest compositions ever written for piano. The finest, beside the famous "moonlight" sonata, are the Appassionata, the temptest, Pathetique, and the Hammerklavier, but there are others also. Beethoven's two masses, the Mass in C and the so-called Missa Solemnis, are great works of Art. The earlier Mass in C is beautiful, but the latter is a powerful work of spiritual grandeur, the likes of which never equaled by another composer. Beethoven's last utterances, the great "Late" string quartets were not understood by his contemporaries. They are personal reflections of the deepest kind. "Among all composers Beethoven thought most of Mozart and Handel, and next came Bach. When I found him with music in his hand or saw some lying on his desk, it was sure to be a composition by one of these heroes." "Once, while out walking with him, I mentioned two perfect fifths, which stand out by their beauty of sound in one of his earlier violin quartets, in C minor. [These were forbidden by music theoreticians.] ....'Well, and who has forbidden them?' he said. Since I did not know how I was to take his question, he repeated it several times until, much astonished, I replied 'It is one of the fundamental rules.' Again he repeated his question, whereupon I said: 'Marburg, Kirnberger, Fuchs, etc., etc,. all the theoreticians!' 'And so I allow them!" was his answer.'" "At times Beethoven was extremely violent. On day, at noon, we were eating dinner in the Swan Tavern when the waiter brought him the wrong dish. No sooner had Beethoven remarked about it and received a somewhat uncivil reply, than he took up the platter -- it was calf's lights with an abundance of gravy -- and flung it at the waiter's head. The poor fellow as carrying a whole slew of other portions, intended for other guests, on his arm. The gravy ran down his face, and he and Beethoven shouted and abused each other while all the other guests burst into laughter. Finally, looking at the waiter -- who looked so comical licking up the gravy that trickled down his face, attempting to curse, but having to lick instead -- Beethoven burst out laughing himself." "When Steibelt, the famous piano virtuoso, came from Paris to Vienna, in all the glory of his fame, several of Beethoven's friends were afraid that Beethoven's reputation would be injured by the newcomer. Steibelt did not visit Beethoven; they met for the first time in the home of Count Fries, where Beethoven gave his new Trio in Bb Major, Opus 11. Steibelt listened to it with a certain condescension, paid Beethoven a few compliments, and felt assured of his own victory. He then played a quintet he had composed and improvised; his tremulandos, at that time a novelty, made a great impression on the listeners. Beethoven could not be induced to play again. "Eight days later there was another concert at Count Fries' home. Seibelt again played a quintet with much success and then improvised a brilliant fantasy for which he had chosen the identical theme developed in the variations of Beethoven's trio! This roused the indignation of Beethoven and his admirers. "When it came time for Beethoven to play, he seated himself at the piano to improvise, which he did in his usual, I might say unmannerly, fashion -- flinging himself down at the instrument as though half-pushed. As he moved toward the piano, he took up the violoncello part of Steibelt's quintet, purposely put it on the piano-rack upside-down, and then drummed out a theme from its first measures with his fingers. Then, now that Steibelt has been definitely insulted and enraged, Beethoven improvised in such a way that Seibelt left the room before Beethoven had finished, refusing ever to meet Beethoven again, and even made it a condition that Beethoven was not to be invited where his own company was desired." Que fait alors Beethoven? - Bien loin de se livrer au d�sespoir, de vouloir en finir avec une vie mis�rable qui ne lui offre plus aucun attrait ext�rieur, il regarde en lui-m�me, dans cette �me qu'il s'est toujours efforc� de diriger vers Dieu, source de tout bien et de toute beaut�. "Oui," disait-il � Stumpff en 1824, "qui veut toucher les coeurs devra chercher en haut son inspiration. Sans quoi il n'y aura que des notes - un corps sans �me - n'est-ce pas? Et qu'est-ce qu'un corps sans �me? De la poussi�re, un peu de boue, n'est-ce pas? - L'esprit devra se d�gager de la mati�re o�, pour un temps, l'�tincelle divine est prisonni�re. Pareil au sillon auquel le laboureur confie la pr�cieuse semence, son r�le sera de la faire germer, d'en obtenir des fruits abondants, et, ainsi multipli�, l'esprit tendra � remonter vers la source d'o� il d�couler. Car ce n'est qu'au prix d'un constant effort qu'il pourra employer les forces mises � sa disposition, et que la cr�ature rendra hommage au Cr�ateur et Conservateur de la Nature infinie."